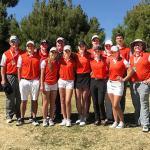 The Lady Bulldog golf team took top honors and one more step toward punching their team ticket to the Class 5A State Tournament Tuesday at Colonial Park in Clovis. 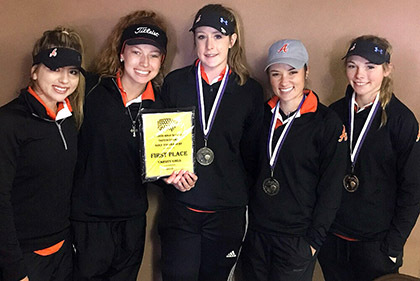 Not only did the Artesia girls secure their second of three necessary team legs for state with a cumulative score of 333, all five varsity golfers also logged individual state legs. Sophomore Taysea Powell won the tournament individually with a stellar round of 74 for her second team leg. Also picking up a second leg were senior Josey Jackson, who placed second with a 78; junior Brehnan Davis, third overall with an 85; and senior Christa Bratcher (96). Senior BriLe Ybarra notched her first state leg with a 96. The Lady ‘Dogs were 45 shots better than second-place Clovis (378) on the day, while Carlsbad took third with a 417. The Bulldogs, meanwhile, had an off day at Colonial Park, leaving them short of a second team qualifying leg. The Artesia boys finished fourth with a 348 behind Clovis (311), Portales (329) and Carlsbad (338), and were also unable to add to their individual legs at the event. Seniors Parker Sanders and Wesley Davis led the team in Clovis with rounds of 81 and 82 respectively, followed by sophomore Canon Carter with a 91, senior Hector Flores with a 94, and freshman Kincaid Jackson with a 109. The Bulldogs will have a chance to get back on track while the Lady Bulldogs strive to complete their team qualifications Monday at the annual Artesia Invitational at the Artesia Country Club.